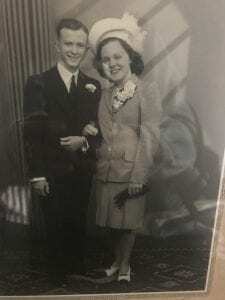 This image is my grandparents wedding photo. They got married in 1946 in South Africa where both of were born and raised. In South Africa, weddings are not a huge production and my grandparents did not have a lot of funds so my grandmother wore this lovely suit to her wedding. The designer is unknown but I felt it was very indicative of the time period. This is right around the time that Chanel would re-open her fashion house. The style and length of skirt also show the timing and overall styling of the look show the European influence into South Africa. My grandmother is decent from England and France so when England came into Africa they brought the western styles with them. I chose this image because I was very intrigued with the ideas it brings up. It shows the spread of western dress into places like South Africa. It also conveys the new type of woman who would wear a suit to her wedding. The menswear inspired suit is what she decided was her wedding attire. I love the entire styling of the look with the shoes and the hat. I have an emotional connection to this image because my grandmother is the woman who taught me how to be extremely kind but also to not take any nonsense from anyone. She was such an empowering person in my life and this image shows just that. She took the mens style and wore it as her own. This image was something that spoke to me because I enjoy the styling of the look itself, the representation of empowering women, and the idea of the spread of fashion. I want to research the time period of late 40s or early 50s because it enjoy the aesthetic. This image shows that even if the woman is a homemaker it does not mean she cannot look or be empowered. In my own design work, I intend to make women feel empowered. I also enjoy menswear influence show in her suit. I have a strong personal connection to this look because it is both stylish and a reminder that clothing can reach all ends of the earth. This is the image I very much would like to work with for my final paper. 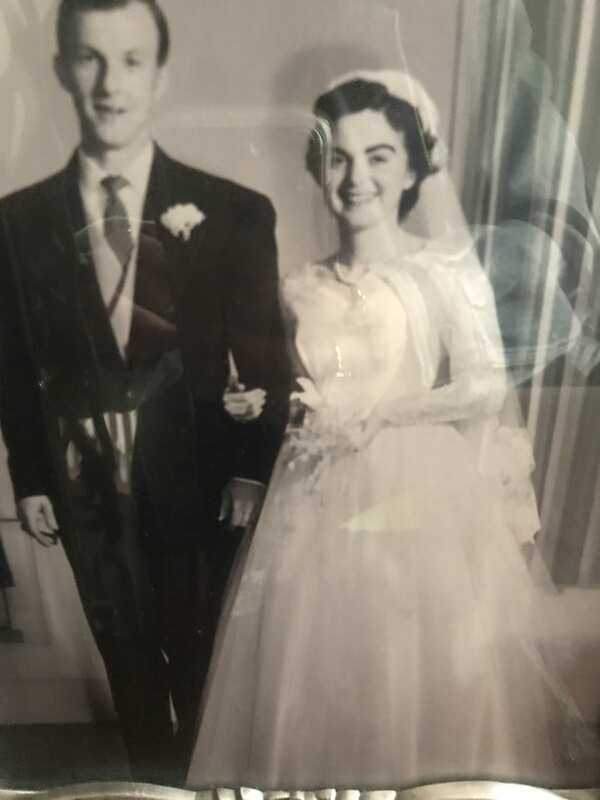 This image is my other set of grandparents on their wedding day. They got married in 1955 in New Hampshire, USA. They met at work where my grandmother was a lab technician. This look here is a more decorated bridal ensemble. The silhouette is very indicative of the time period and the lace and the buttons add a richness to the design. She wore a traditional veil because they were both devote catholics married in the catholic church. The designer is unknown but the design of the dress illustrates the time period very well. I enjoy this photo because it again is an image of love and my grandmother looks so incredibly beautiful. Aesthitically, I find her dress and this photo to be very pleasing. The softness of the lace, the decoration of the buttons, and the fullness of the skirt are all gorgeous. I have a strong emotional connection to this image because my mother’s mom seen here was one of my favorite people to ever live. She was just happy that I existed in this world, and she would love when I would give her fashion advice. This image is beautiful and showed the time period that I find very intriguing from a female perspective. My design aesthetic is meant to empower woman. This image was taken during the 1950s when there was a lot of changes in the role of the female. My grandmother put herself through university and worked as a scientist and when she got married she still worked and took care of four children. As delicate as this dress is it shows her power underneath. She is wearing the voluminous dress; the dress is not wearing her.